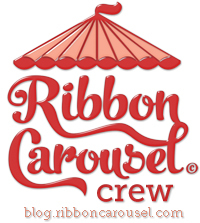 Welcome to day 2 of the Sweet ‘n Sassy September feature Blog Hops! 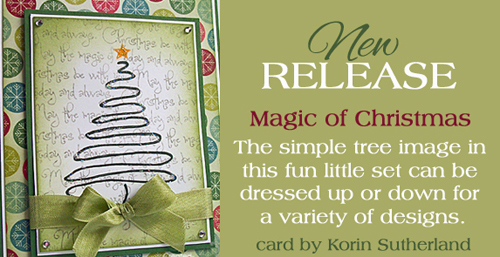 Today we’re featuring Korin’s sweet new Magic of Christmas stamp set. The tree in this set is not only cute…it makes a very quick & easy image for your cards! I used an old technique called Poppin’ Pastels to stamp and color the tree. I stamped it onto patterned paper, applied the chalks, and then the sentiment was stamped overtop. Here’s a closer view. stamps- SNSS Magic of Christmas; paper- brown, SU! Artichoke, KaiserCraft December 25th; ink- Versamark, Versafine Black, Distress Tea Dye; accessories- pastels, tracing wheel, rhinestones, button, thread. This entry was posted in cards, etc., Christmas, Sweet 'n Sassy. Bookmark the permalink. Such a pretty combo of dp’s, Diane, the soft colours and the over stamping of the sentiment all add up to a lovely, creative card! Love this and the technique! Beautiful….love the colors of your card and the pretty poppin pastel. Great Christmas card, I love it! I’ve got to try the technique also. Thanks for sharing. I’ve forgotten all about this technique, Diane! Love your Christmas tree with the pretty combination of papers…wonderful design! lovely card! the soft colour of chalks and then the stamping over top is beautiful! Pretty!! I like your use of that technique here! Pretty layer papers too. Wonderful card. Very warm and inviting. Very pretty! The chalks give a little different twist on this image. Makes it softer, I think. Beautiful card Diane. Love that you stamped the tree on the soft designer paper. 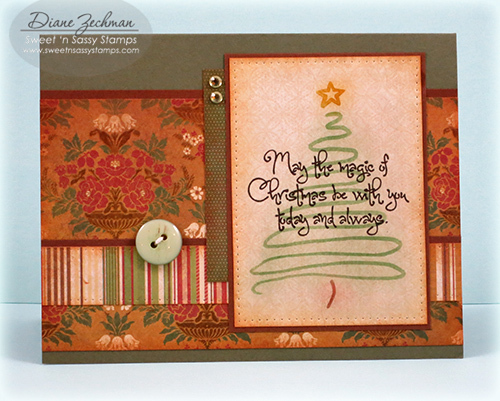 Pretty vintage looking card Diane! 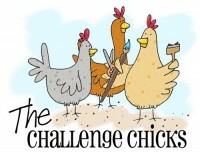 Very interesting technique you used for our image…will have to dust off my chalks. Great card, Diane! Love the homespun look of it! 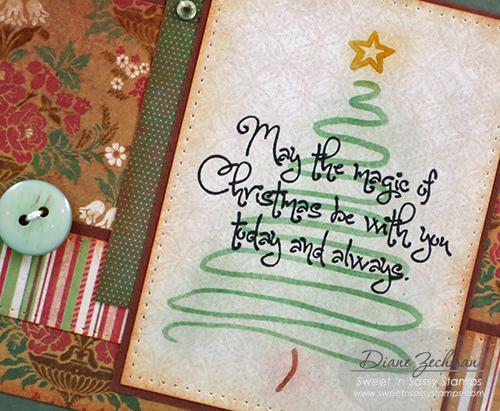 The sentiment stamped over the tree is darling, Diane; sweet card! Pretty colors of papers and great technique. pretty card, like how you made the tree a background and the saying on top! Great card! 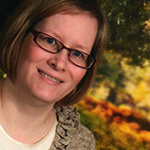 Great use of the tree as background. 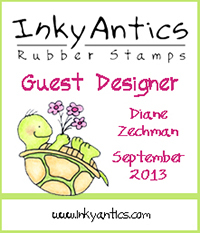 ooh..>I love how many styles have come from this simple tree stamp…You’ve really shown this off well on your card! What a beautiful card! Like the sentiment stamp on top of the tree.